round competitive program. Here she first became exposed to USA Swimming, which allowed her to compete on the national level. and her Mom were very impressed. The Little Flower swimmers had displayed such great team spirit and a strong work ethic. times in the Philadelphia Catholic League. We knew then that we were going to have someone special swimming for LF. and it showed immediately for Little Flower Swimming. In Ally's very first meet, she broke the league record in the 100yd Freestyle. This would be the first of many records Ally would break in her high school career. first Little Flower swimmer to do so. At State Champs, Ally just missed qualifying for finals, capping off an incredible year. first in Little Flower and PIAA District 12 AAA history. Junior year, Ally continued her dominance of the league. In addition, the entire team had 'career' years. We had an undefeated season, going 10-0. Ally again dominated PCL and PIAA District Championships, winning all of her events, qualifying her for State Championships for the third straight year. Another feather in LF's swim cap was achieved at this meet. Led by Ally, the 400yd Freestyle relay team swam the meet of their lives! They knocked out Archbishop Ryan, the defending eight-year champions, by a single point, 456-455. Thisqualified the girls for state champs for the first time ever. meet, the most prestigious meet in the US, and second only to the Olympics. a great experience for Ally and she was able to improve her positions in her events. beaten by current Olympian Leah Smith. on the east coast. Health issues prevented Ally from performing at her best in her freshman year. But sophomore season, Ally was committed to making up for lost time. 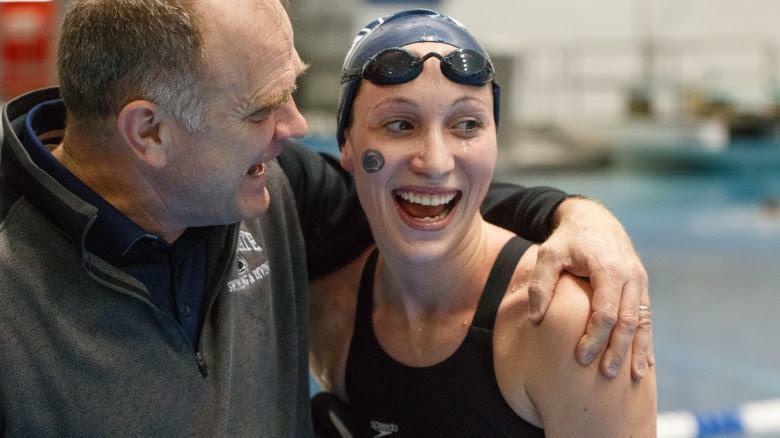 She had a breakout season, becoming a team leader in the pool. medal at Big10 Swimming Championships, and All American honorable mention at NCAA Championships. 11th in the country in the 400 meter Freestyle. Ally had the greatest improvement, overall, of any swimmer at the meet, male or female. can achieve in a non-Olympic year. The future is very bright for Ally. She has a very strong shot at contending for an Olympic spot three years from now at the 2020 Olympic Trials. It is incredibly exciting to see one of our alums on the national and world stage. Congratulations and blessings to Ally as she plunges into her swimming future!